M.S., 1986, Cornell University, Physical Chemistry, Theoretical Chemistry minor. B.S., 1983, West Virginia Wesleyan College, Chemistry major, Mathematics minor. Following postdoctoral training as a National Institutes of Health postdoctoral fellow at the University of California, Berkeley, I moved to Los Alamos National Laboratory as a J. Robert Oppenheimer Fellow, and subsequently a technical staff member, where I worked for a total of 18 years. At Los Alamos, I served in various scientific and technical leadership positions, most recently within the Center for Integrated Nanotechnologies (CINT), a Department of Energy (DOE) Nanoscience Research Center. 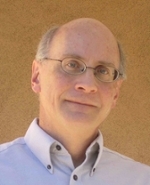 In 2012, I moved to the University of New Mexico as Director for the Center for Biomedical Engineering, where my current research interests include development of optical-based methods for biomedical and biosensing applications, study of photophysical behavior of biological and nanostructured materials, and development of spectroscopic and optical instrumentation. I am committed to teaching and mentoring, with an emphasis on training students in the use of quantitative analysis and measurement methods in the study of biological systems, and am also engaged in translating research advances to real-world applications as exemplified by patents and industrial collaborations based on biological sensing and optical imaging technologies.